NASA's Mars Odyssey spacecraft has tweaked its orbit to help scientists make the first systematic observations of how morning fogs, clouds and surface frost develop in different seasons on the Red Planet. The maneuver took place Tuesday, Feb. 11. Odyssey team engineers at NASA's Jet Propulsion Laboratory in Pasadena, Calif., and Lockheed Martin Space Systems of Denver, designed the gentle move to accelerate Odyssey's drift toward a morning-daylight orbit. The desired change will occur gradually until the intended orbit geometry is reached in November 2015 and another maneuver halts the drift. The change will enable observation of changing ground temperatures after sunrise and after sunset in thousands of places on Mars. Those observations could yield insight about the composition of the ground and about temperature-driven processes, such as warm-season flows observed on some slopes, and geysers fed by spring thawing of carbon-dioxide ice near Mars' poles. 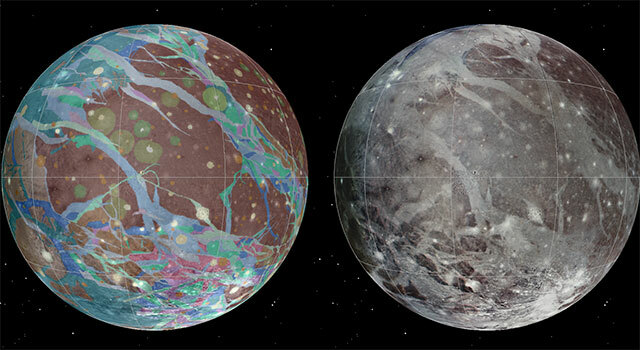 "We're teaching an old spacecraft new tricks," said Odyssey Project Scientist Jeffrey Plaut of JPL. "Odyssey will be in position to see Mars in a different light than ever before." 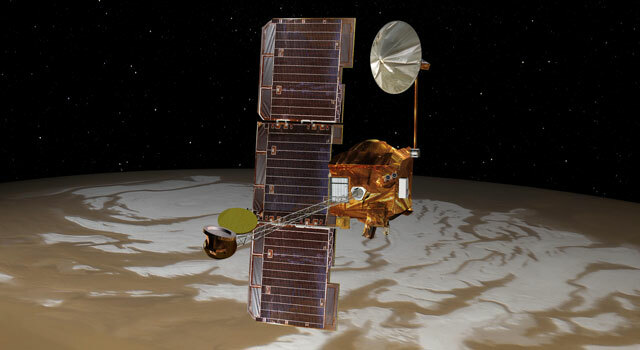 Neither Odyssey, nor any other NASA Mars orbiter since the 1970s, has flown an orbital pattern with a view of the ground in morning daylight. Earlier NASA orbiters and the European Space Agency's Mars Express orbiter have provided some tantalizing views of morning mists on Mars, but have concentrated on afternoon observation times when views of the surface are less hazy. Odyssey was launched in 2001 and began its science mission 12 years ago this month. It is the longest-working spacecraft ever sent to Mars. Odyssey completed Tuesday's maneuver at 12:03 p.m. PST (3:03 p.m. EST). It used four thrusters, each providing about 5 pounds (22 newtons) of force for a 29-second burn. "This veteran spacecraft performed exactly as planned," said Odyssey Project Manager David Lehman of JPL. Odyssey flies in an orbit nearly over the poles and synchronized with the sun. For most of its first six years at Mars, the orbit was set at about 5 o'clock, local solar time. At every spot Odyssey flew over as it made its dozen daily passes from the north pole region to the south pole region, the local solar time was about 5 p.m. Beneath the south-to-north leg of the orbit, the time was about 5 a.m. That orbit provided an advantage for the orbiter's Gamma Ray Spectrometer to have its cooling equipment pointed away from the sun. The spectrometer checked for evidence of water near the Martian surface. It made important discoveries of how widely water ice -- detected as hydrogen-- and other elements are distributed on Mars. Later, Odyssey worked for three years in a 4 o'clock orbit. 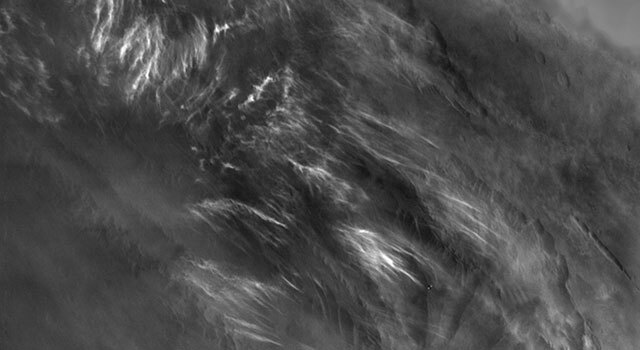 That provided an advantage for mineral mapping by the orbiter's Thermal Emission Imaging System (THEMIS). Mid-afternoon warmth made minerals' infrared signatures easier to identify. This timing, however, added stress to Odyssey's power system. It put more of each orbit into the planet's shadow, where solar panels are unproductive. After providing radio-relay support for the 2012 landing of NASA's Curiosity Mars rover, a maneuver set Odyssey on a slow drift to later times of day to help preserve the spacecraft's aging battery. THEMIS Principal Investigator Philip Christensen of Arizona State University in Tempe, proposed letting the time of the orbit shift past 6 o'clock and then making daylight observations on the south-to-north half of the orbit, at about 6:45 a.m., rather than the north-to-south half. The science team and NASA agreed, and the Odyssey project planned this week's maneuver to get to the desired orbit sooner. "We don't know exactly what we're going to find when we get to an orbit where we see the morning just after sunrise," Christensen said. "We can look for seasonal differences. Are fogs more common in winter or spring? We will look systematically. We will observe clouds in visible light and check the temperature of the ground in infrared." After the next orbit-adjustment maneuver, to lock into the 6:45 a.m. local time in November 2015, Odyssey will have about enough propellant left for nine to 10 years of operation at estimated annual consumption rates. In addition to conducting its own observations, Odyssey serves as an important communications relay for spacecraft on Mars' surface.